When Roy Moore, the Chief Justice of the Alabama State Supreme Court, installed a two-and-one-half-ton granite monument to the Ten Commandments in the Alabama state courthouse in Montgomery in June of 2001, he knew it was a deeply symbolic act. He was saying that God's laws are the foundation of the nation; and of all our laws. Or at least, they ought to be.1 The monument (wags call it "Roy's rock") was installed under cover of night – but Moore had a camera crew from Rev. D. James Kennedy's Coral Ridge Ministries on hand to record the historic event. Kennedy then sold videos of the installation as a fundraiser for Moore's legal defense. They knew he would need it. The story of Roy's rock epitomizes the rise of what many are calling "dominionism." It is a story of how notions of "Biblical law" as an alternative to traditional, secular ideas of constitutional law are edging into mainstream American politics. As readers of The Public Eye know, dominionism—in its "softest" form, the belief that "America is a Christian Nation," and that Christians need to re-assert control over political and cultural institutions—has been on the rise for a long time. Since The Public Eye first began writing about dominionism ten years ago, the movement, broadly defined, has gained considerable power. Recently however, the term has become fashionable with some lumping every form of evangelical Christianity and every faction (which was) in the Bush White House into one big, single-minded imperial dominionist plot. Dominionism is narrower and more profound than that. It is the driving ideology of the Christian Right. Berlet's distinction between hard and soft dominionists is clear and broad enough to describe the two main wings of the movement. But these viewpoints, like the terms "theocrat" and "theocracy," are openly embraced by few. They are terms used by outside observers to understand a complex yet vitally important trend. So for people trying to figure out if a conservative politician, organization, or religious leader is "dominionist," I notice three characteristics that bridge both the hard and the soft kind. 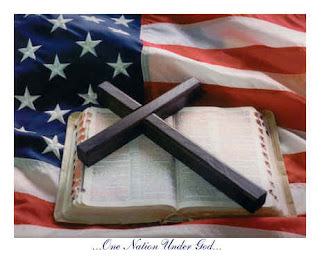 1.Dominionists celebrate Christian nationalism, in that they believe that the United States once was, and should once again be, a Christian nation. In this way, they deny the Enlightenment roots of American democracy. 2.Dominionists promote religious supremacy, insofar as they generally do not respect the equality of other religions, or even other versions of Christianity. 3.Dominionists endorse theocratic visions, insofar as they believe that the Ten Commandments, or "biblical law," should be the foundation of American law, and that the U.S. Constitution should be seen as a vehicle for implementing Biblical principles. Pieces of dominionism spill out in the day-to-day words and activities of our nation's leaders all the time. Senate Majority Leader Bill Frist (R-TN) routinely host(ed) tours of the Capitol for constituents, Congressmembers and their staffs by Christian nationalist propagandist David Barton. President George W. Bush claimed during one of his presidential campaign debates with John Kerry that the United States was founded as a Christian nation. (Former) House Majority Leader Tom DeLay has said the United States should be governed under Biblical law. And a dominionist— Sen. Sam Brownback (RKS) —(was)a hopeful for the Republican presidential nomination for 2008, while other dominionists (who) challenged the GOP through the Constitution Party, the third largest party in the nation. Moore himself (was) challenging a business-oriented incumbent in the GOP gubernatorial primary in Alabama for 2006. Hard dominionists like Moore (took) these ideas to their extremes. They want(ed) to rewrite or replace or supplement the Constitution and Bill of Rights to codify specific elements of Biblical law. This would create a society that would be a theocracy. Soft dominionists like Brownback, on the other hand, propose(d) a form of Christian nationalism that stop(ed) short of a codified legal theocracy. They may (have)embrace(d) a flat tax of 10% whose origins they place(d) in the Bible. They (were) comfortable with little or no separation of church and state, seeing the secular state as eroding the place of the church in society. Dominionism is therefore a broad political tendency—consisting of both hard and soft branches—organized through religiously based social movements that seeks power primarily through the electoral system. Dominionists work in coalitions with other religious and secular groups that primarily are active inside the Republican Party. They seek to build the kingdom of God in the here and now. The three-shared Dominionist characteristics of religious supremacy, Christian nationalism, and theocratic visions are on vivid display in the politics of Moore's ally, Rev. D. James Kennedy, the prominent televangelist. In early 2005, Kennedy displayed Roy's rock at his annual political conference, "Reclaiming America for Christ" in Ft. Lauderdale. "For more than 900 other Christians from across the United States," reported the Christian Science Monitor, "the monument stood as a potent symbol of their hopes for changing the course of the nation." "In material given to conference attendees, [Kennedy] wrote: ‘As the viceregents of God, we are to bring His truth and His will to bear on every sphere of our world and our society. We are to exercise godly dominion and influence over our neighborhoods, our schools, our government ... our entertainment media, our news media, our scientific endeavors—in short, over every aspect and institution of human society." Kennedy, the Monitor noted, "regularly calls the United States a Christian nation that should be governed by Christians. He has created a Center for Christian Statesmanship in Washington that seeks to evangelize members of Congress and their staffs, and to counsel conservative Christian officeholders." The Monitor story show(ed) Kennedy manifesting all three characteristic of a dominionist: he is a Christian nationalist; he is a religious supremacist; and his politics are decidedly theocratic.3 But of the three characteristics, Kennedy would embrace the first, but deny the second and third. The notion we often hear in public these days—of the supposed suppression of Christian expression by an alleged secular humanist conspiracy—stems largely from the works of Reconstructionist R.J. Rushdoony and those of the Reconstructionist- influenced writer, Francis Schaefer. Tim LaHaye, Jerry Falwell, and Pat Robertson also echo(ed) these claims. Virginia Reconstructionist Rev. Byron Snapp maintains, "religious pluralism is a myth. At no point in Scripture do we read that God teaches, supports, or condones pluralism. To support pluralism is to recognize all religions as equal. "5 This is, of course, exactly what the U.S. Constitution requires.6 It is because this is so, in part, that there is such a desperate push for what Rushdoony called "Christian revisionism" of history. Arguably, Moore i(was) emerging as the leading Christian Reconstructionist politician in America. So let's return to the story of Roy's rock. A few years (before), Moore was an obscure Alabama county judge. He gained notoriety when the American Civil Liberties Union sued because he insisted on hanging a hand-carved Ten Commandments plaque in his courtroom and opening the proceedings with a prayer. While the case was ultimately dismissed because the plaintiff lacked standing to sue, Roy Moore became a nationally known as the "Ten Commandments Judge." Moore, 58, turned his notoriety into election as chief judge of the Alabama Supreme Court in November 2000. Six months after his inauguration, he installed the now-famous monument. The ruling by Federal District Court Judge Myron H. Thompson in the inevitable lawsuit declared that the display constituted "a religious sanctuary, within the walls of a courthouse." He ordered Moore to remove it; Moore refused, and he was ultimately removed from the bench. Judge Thompson was additionally troubled by Moore's partnership with Rev. Kennedy. He wrote that it "can be viewed as a joint venture between the Chief Justice and Coral Ridge, as both parties have a direct interest in its continued presence in the rotunda.... In a very real way, then, it could be argued that Coral Ridge's religious activity is being sponsored and financially supported by the Chief Justice's installation of the monument as a government official." Moore became a cause celebre and a popular speaker at major gatherings of such organizations as the Christian Coalition and Eagle Forum. He was publicly courted to head the national ticket of the overtly theocratic Constitution Party in 2004 and he appeared at numerous state party conventions while being publicly coy about his intentions.7 (Founded in 1994, it was originally called the U.S. Taxpayers Party.) The GOP was rightfully concerned that Moore might divide Bush's conservative Christian constituency and threaten his reelection. But he was able to use this leverage to move elements of the GOP in his direction. Moore and his attorney Herb Titus (vice-presidential candidate of the Constitution Party in 1996) drafted the Constitution Restoration Act, which would allow local, state and federal officials to acknowledge "God as the sovereign source of law, liberty, or government" and prevent the U.S. Supreme Court from gagging them. Sen. Richard Shelby (R-AL), Sen. Sam Brownback (R-KS), and Rep. Robert Aderholt (R-AL) signed on as the bill's main sponsors, and announced its introduction at a press conference in Montgomery, Ala., in February 2004. Both the House and Senate held hearings on the bill in 2004, and Sen. Shelby reintroduced it in 2005 (S.520). As of September, it had eight GOP cosponsors. In the House (H.R.1070) Rep. Aderholt had 43 cosponsors. It is a classic and pioneering "court stripping" bill, stripping the Supreme Court of its power of oversight. The clear presumption of the bill is that God's law is, once was, and should always have been the cornerstone of law and jurisprudence in the United States. While at this writing, the bill has not, and may never progress out of committee, the depth of support for a bill of such profound consequence is one fair measure of how far the most overt dominionist agenda has come. The rhetoric of Roy Moore, David Barton and other Christian Right leaders not withstanding, the framers of the U.S. Constitution explicitly rejected the idea of a Christian Nation. The framers, seeking to inoculate the new nation against the religious persecution and warfare that had wracked Europe for a millennium, made America the first nation in the history of the world founded without the blessing of an official god, church or religion. They were leaving behind local theocracies that had governed the colonies for the previous 150 years in which only white propertied men who were members of the correct, established sect were able to vote and hold public office. One of the formative experiences of the young James Madison was witnessing the beating and jailing of Baptist preacher who preached—it was against the law in Anglican Virginia. Madison went on to become the principal author of both the Constitution and the First Amendment. Among the many historical issues faced by dominionists who embrace Christian nationalism and seek to revise history in support of their contemporary political aims, one is so clear and insurmountable that it is routinely ignored: Article 6 of the Constitution bans religious tests for holding public office—no more swearing of Christian oaths. By extension, this meant that one's religious orientation became irrelevant to one's status as a citizen. It was this right to believe differently, that set in motion the disestablishment of the state churches—and set the stage for every advance in civil and human rights that followed. Moore has taken his show on the road, speaking about his alternative view of American history at major and minor Christian Right conventions, and displaying the monument. It is typically cordoned off with velvet ropes and viewed with reverence, awe and rubber necking. Moore evidently set out to provoke a confrontation with the federal courts over the Ten Commandments monument—one he was destined to lose, much as Alabama Governor George Wallace lost in his defense of legal segregation 40 years before. While Alabama has its distinctive politics, we can also see dominionist politics in the mix of the aggressive efforts to restrict access to abortion and to deny equal rights to gays and lesbians—and in the efforts to teach creationism and its variant "intelligent design" in the public schools. Naturally, people look for explanations for how it has come to this. There are many factors for this trend, just like any other important trend in history. But many Americans, regardless of their political orientation, seem genuinely baffled and obsessed about one or another factor in the rise to power of the Christian Right: they look to issues of funding, mass media, megachurches, dominionism, and so on. It is all of these and more. However, following the logic of Occam's Razor, that the best explanation is usually the simplest, I offer this: the Christian Right social movement, fueled by the growing influence of dominionist ideology, gained political influence because it was sufficiently well organized and willing to struggle for power. And now they are exercising it. While most dominionists would say they favor the U.S. Constitution, and merely seek to restore it to the original intentions of the founders, in fact, their views are profoundly anti-democratic. The dominionist worldview is not one based on the rights of the individual as we have come to know them, but on notions of biblical law. Among the political models admired by the likes of D. James Kennedy, Pat Robertson and Reconstructionist writer Gary North is the Massachusetts Bay Colony, a government ruled by the intensely Calvinist Protestant sect, Puritanism. In the dominionist worldview, the biblically incorrect (and those of other religious views) are second-class citizens at best. While few would admit to the clear implications of Christian nationalism, dominionism in the short run necessarily means, as a matter of theocratic public policy, reducing or eliminating the legal standing of those who do not share their views. Indeed the dominionist movement and its allies in Congress are actively seeking to eviscerate the capacity of the federal courts to protect the rights of all citizens. Developing a coherent understanding of the ongoing role of dominionism in the dynamic growth of the Christian Right movement will be integral to any effective counter strategy in this, one of the central struggles of our time. Frederick Clarkson has researched and written about the religious right for going on 25 years. He is the author of Eternal Hostility: The Struggle Between Theocracy and Democracy, and is a member of The Public Eye editorial board. He blogs at www.FrederickClarkson.com and www.Talk2Action.com. 1. Frederick Clarkson, “On Ten Commandments bill, Christian Right has it wrong,” Christian Science Monitor, April 21, 2004. 2. Chip Berlet. 2004. "Mapping the Political Right: Gender and Race Oppression in Right-Wing Movements." In Abby Ferber, ed, Home-Grown Hate: Gender and Organized Racism. New York: Routledge. 3. Jane Lampman, For evangelicals, a bid to ‘reclaim America,' The Christian Science Monitor, March 16, 2005. 4. Brent Thompson, "Baptist idea of religious liberty affirmed at doctrinal conference," Baptist Press, September15, 2005. 5. David Cantor, The Religious Right: The Assault on Tolerance and Pluralism in America, Anti-Defamation League, 1994. 6. For a detailed discussion, see Frederick Clarkson, Eternal Hostility: The Struggle Between Theocracy and Democracy, Common Courage Press, 1997. 7. Fred Clarkson, "Will Roy Moore Crack the Bush base?" Salon, May 4, 2004. 8. Joe Morecraft III, "Restoring the Foundations," Counsel of Chalcedon, June 2004. This speech is "An Exposition and application of Psalm 11 given at Judge Roy Moore's Foundation for Moral Law conference in Montgomery, Alabama, February 13, 2004." 9. Joshua Green, "Roy and His Rock," The Atlantic Monthly, October 2005. 10. Nina Easton, "Conservative's popularity may be problem for GOP," The Boston Globe, June 14, 2005.
a well-known Supreme Court candidate lauds an antebellum slave trader and appears with hate group leaders," Intelligence Report, Fall 2004. 13. Frederick Clarkson, Eternal Hostility: The Struggle Between Theocracy and Democracy, Common Courage Press, 1997, pg 78. 15. Lee Duigon, "Is There Hope for Our Judiciary? Yes, Says Ten Commandments Judge Roy Moore," Chalcedon Report, October 6, 2005. Read also American Nationalism: Is Our Freedom Under Attack?